Jealous co-workers can create a hostile work environment. Jealousy on the job is something you have no control over. It is an inward problem that affects many employees for a variety of reasons. Although there is nothing you can do to change the inward emotion of another co-worker, you are not powerless when it comes to his outward behavior. If the jealous employee's outward behavior is creating a hostile working environment for you, there is way to handle the matter professionally and effectively. Check yourself to make sure you are not deliberately doing something to make your co-worker jealous -- for instance, constantly throwing in her face that you got the promotion and she didn't. If you are doing something to make your co-worker jealous, stop it. If you cease your behavior, she may cease hers. Keep a journal of all incidents that occur between you and the jealous employee, including the date and time of the incident, as well as the name of witnesses. Speak with the employee one-on-one to ask what problem he has with you. 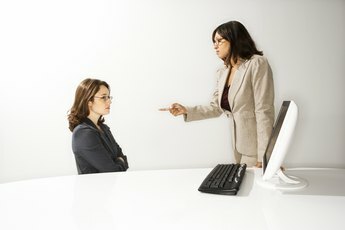 When speaking with the employee, do it in a nonconfrontational manner. Speak with a calm voice, instead of yelling. Avoid talking over the employee. Document in your journal the results of your one-on-one meeting with the jealous employee. Write down what you said, as well as what she said. Avoid getting caught up in workplace gossip about the employee and her jealousy. Doing so will only make matters worse, especially if something you say gets back to the jealous coworker. Complain to management if the employee continues to create a hostile working environment for you. Show management a copy of your incident journal. Ask management to intervene in the matter. 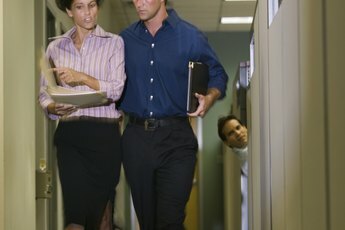 If working in a team-oriented environment, you may ask management to move you or the jealous employee to another team. File a grievance with the human resources department if management neglects to investigate and resolve the matter. When filing a grievance, explain the results you desire to see. Human resources has a certain number of days to address and resolve your grievance. The exact number of days varies by company. What to Do if You Are Attracted to Your Employee?